Experience the adventure of rock climbing at your home without risking your life. With this indoor rock climbing treadmill, you can convert the dangerous climbing exercise into a fun. The hand and foot holds are strategically customized so that you can practice your climbing skills without risking your life. Busy schedules these days leave us with no time to hit the gym or a therapist. One of these relaxing trigger point grid foam roller with free online instructional videos gives you the liberty of relaxing your muscles at home, whenever you get free time. The product has been clinically tested. 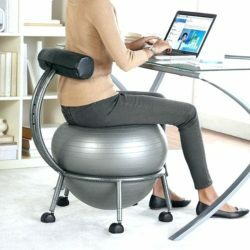 This exclusive adjustable fitness ball chair with its innovative bigger and wider wheels provides you a smoother rolling experience. You have a choice of two frames and numerous vibrant colors to choose from. It can be adjusted in two different ways to provide full functionality. This powerful ball has a 300-pound limit.